Sen. James Inhofe threatened to filibuster Chuck Hagel if necessary to prevent his confirmation as the next US secretary of defense. Sen. James Inhofe (R-Okla.), the ranking member of the Senate Armed Services Committee, threatened on Sunday to filibuster former Sen. Chuck Hagel (R-Neb.) if necessary to prevent his confirmation as the next United States secretary of defense. “I would threaten to cause a 60-vote margin. If it took a filibuster, I’d do it that way,” Inhofe told Fox News on Sunday. “They are predicating it on the assumption that we haven’t been doing it. In the last nine years we’ve done it nine times; some of them have been confirmed some have not,” the senator said, dismissing suggestions that Republican colleagues would be reluctant to support him. While Hagel has come under intense fire for his record on Israel, Iran, Hamas, as “the Jewish lobby,” and a myriad of other issues, Inhofe is the first GOP senator to publicly support a possible filibuster to prevent his confirmation. Senate Majority Leader Mitch McConnell last week refused to rule out a filibuster saying it was “not yet clear” what steps Republicans would take to block the confirmation. “I think the opposition to him is intensifying. Whether that means he will end up having to achieve 60 votes or 51 is not clear yet,” McConnell said. If Republicans do not filibuster Hagel, he would likely be confirmed. No Democrats have come out against his nomination, and the party holds a 55-45 majority in the Senate. 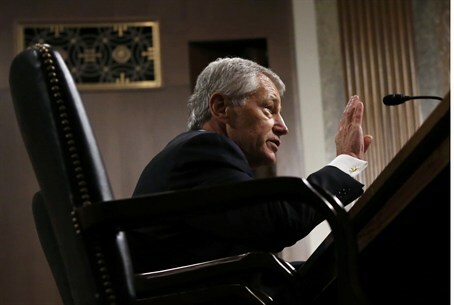 Even with a filibuster, however, Hagel could secure enough support. Thus far two GOP lawmakers, Sens. Thad Cochran (R-Miss.) and Mike Johanns (R-Neb.) have endorsed his nomination. The Senate Armed Services Committee vote on Hagel, which was expected to take place last Thursday, was delayed after Republicans requested that Hagel provide additional financial information, including details regarding compensation for speeches he delivered since leaving Capitol Hill. Republican senators had sent a letter to the controversial nominee prior to the vote, asserting their opposition saying, "This committee, and the American people, have a right to know if a nominee for secretary of defense has received compensation, directly or indirectly, from foreign sources." "Until the committee receives full and complete answers, it cannot in good faith determine whether you should be confirmed as secretary of defense," the letter stated.